In 2017 dozens of REACH members came to the General Assembly in Raleigh to protest House Bill 467. All photos by and property of Swine Country Documentary Project. Hurricane Florence was the third hurricane in 22 years to threaten Eastern North Carolina with rivers of hog waste. 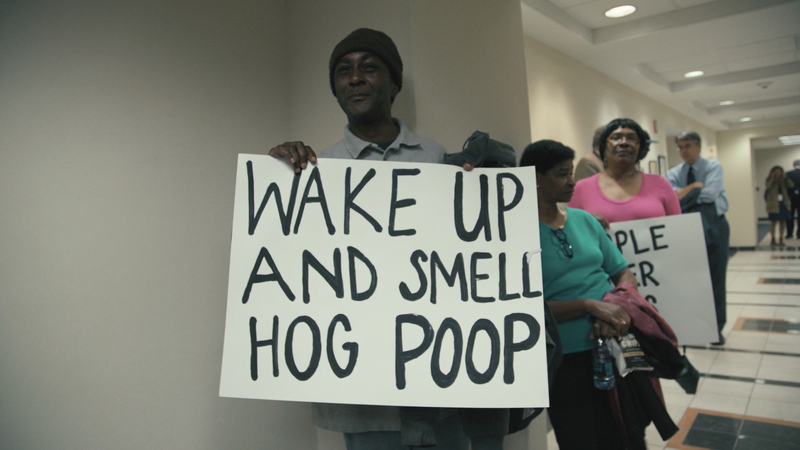 This is the second in a two part series by documentarian Sol Weiner about a community’s long fight against state regulators and the hog industry for environmental justice. Read part one here. Fed up with decades of poor governance and neglect from the North Carolina Department of Environmental Quality (DEQ) and the abuses of contract growers and the North Carolina Pork Council, a powerful corporate lobby in the state, the Rural Empowerment Association For Community Help (REACH) joined other complainants—the North Carolina Environmental Justice Network and the Waterkeeper Alliance, to file a civil rights complaint against DEQ with the U.S. Environmental Protection Agency (EPA) in September 2014. The complaint alleged that DEQ’s permit-granting process was unfair to people of color who are more likely to live in close proximity to hog farms. Title VI of the Civil Rights Act of 1964 prohibits recipients of federal funding, like DEQ from discrimination in their decision-making process, including where they issue permits for toxic industries. Devon Hall shows off REACH's air-quality monitoring equipment. Five months passed before they heard from EPA whether their complaint was accepted. That’s longer than the time allowed by statute but still shorter than that of many other cases. Federal courts elsewhere have ruled twice—including in January 2018 regarding a decades-old water case in Flint, Michigan—that the EPA violated the Civil Rights Act by delaying decisions and investigations years beyond their deadlines. Further, the EPA dismisses 95% of complaints without review and has only issued one formal finding of discrimination in its history. Finally, in February 2015, EPA accepted jurisdiction for REACH’s complaint and offered to provide mediation for the parties involved, a process known as Alternative Dispute Resolution. For Hall, it was a long-awaited opportunity to come to the table with DEQ and EPA and speak directly to them. He would have to wait longer. EPA took another five months to recommend a mediator and begin scheduling meetings. Though mediation began in March 2015, REACH and other complainants terminated that process in May 2016 after DEQ repeatedly failed to engage meaningfully with them. The EPA resumed the investigation, which had been temporarily suspended during mediation. The complainants walked away from mediation for the same reason the courts found Michigan’s DEQ in violation. DEQ—led by then-secretary Donald Van Der Vaart—had informed the North Carolina Pork Council, the industry’s trade organization, of the mediation sessions. The Pork Council was not party to the complaint and had no legal right to participate, but their representatives showed up anyway. Organizers are certain the Pork Council meant to intimidate them. The EPA lacks a credible threat of punishment for rule-breakers. Tasked both with regulating the regulators and responding to infractions, the agency can’t keep up with the workload. Fines of any size levied against offenders can be factored into the costs of doing business. Even large-scale infractions that result in serious environmental and human health damage rarely end in criminal charges or sanctions. “Every violation can technically be treated as a crime,” according to John Jay College’s Center on Media, Crime, and Justice, “but federal environmental law gives agencies discretion to pursue civil or administrative charges instead.” They added that, in most years, of 64,000 violators (many of whom are continual and repeat-offenders) listed in the EPA’s database, only one-half of one percent of crimes trigger criminal investigations. Frustrated and hamstrung, the complainants realized that without direct action their complaint would languish in the administrative process. REACH had worked in some capacity with the EPA since their founding, including to fund REACH’s programming. Those years of work set the stage for a visit to the seat of EPA’s power in Washington, D.C. If the EPA wasn’t interested in investigating REACH’s case, activists figured they deserved to hear it to their faces. So, with a busload of residents in tow and armed with a Change.org petition with over 100,000 signatures, REACH and NCEJN traveled to Washington D.C. just days before the 2016 election to demand the EPA take action in their complaint. REACH members join together in solidarity at the end of July's monthly meeting. Shortly after the trip EPA sent a “letter of concern” to DEQ. Among other deficiencies, it noted, DEQ did not even have a Title VI enforcement program. The letter, though stronger than usual for the EPA, was not a formal finding of discrimination. However, in marked contrast to recent administrations, North Carolina’s current DEQ, led by Roy Cooper-appointee Secretary Michael Regan, was responsive to EPA’s concerns. After receiving the letter, DEQ and the complainants returned to the table and continued mediation. On May 3, 2018, Waterkeeper Alliance announced that they, REACH, NCEJN, DEQ, and EPA had reached a settlement. In anticipation of the 2019 General Permit Renewal deadline, DEQ agreed to install air-monitoring machines, test water quality, expand public participation through a stakeholder process with more frequent and accessible meetings, create an environmental justice advisory board, establish a point system for farms that violate permit guideline, and add a Title VI and Environmental Justice Coordinator position to DEQ. In some cases, DEQ simply agreed to do what it was already supposed to be doing. It took more than four years—and in truth much longer than that—to gain the most modest, basic protections. Title VI’s future is uncertain. Environmental Justice activists’ success in this case is the exception rather than the rule. They see this victory, however, as more of an opening than a conclusion. REACH’s and their co-complainants’ fight is for specific political and material demands—an end to lagoon-and-sprayfield waste disposal, stricter monitoring, more public planning. How the system gets to those ends is largely out of their hands. REACH has shown already that the powers-that-be have more to lose by ignoring the truth and the growing power of the people than by reckoning with it. Ra Malika Imhotep writes on the abolitionist dreamscape of kai lumumba barrow’s gallery of the streets. Tennessee-based writer and journalist S. Heather Duncan covers two recently published books by Jessica Wilkerson and Ginny Savage Ayers that uplift lesser known histories of Appalachian women at the heart of hard-fought labor struggles.